Create a holiday accent that’s a twist on decorative lighting fixtures. A hanging ornament chandelier can be hung from your real chandelier, or from the ceiling, banister, or any lofty space that you’d like to decorate. 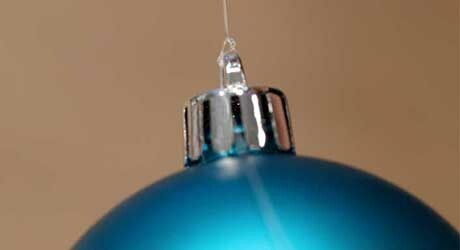 This guide will walk you through the process of turning ornaments into a chandelier. 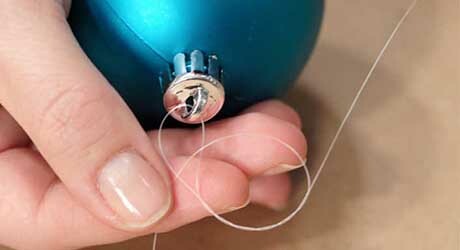 Thread a monofilament strand through the cap of one ornament, leaving about 5 inches on one end. Make a barrel knot to secure the monofilament to the ornament. To tie a barrel knot, wrap the 5-inch end of the monofilament about six times around the long monofilament strand. Take the end of the short strand and slip through the six wrapped monofilament loops, and tighten. Tie a standard knot to secure. Repeat Steps 1 and 2 for each ornament. 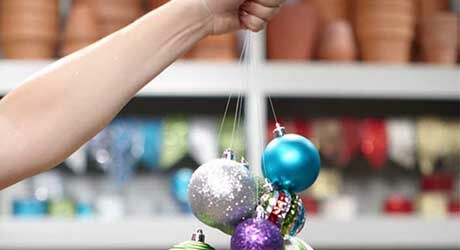 Bundle the ornaments together and grasp by the monofilament. Holding the monofilament bundle in your hand, adjust the ornament strand lengths to your desired arrangement. 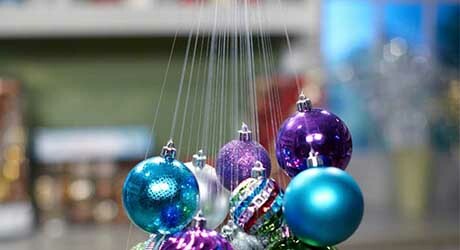 Once the ornaments are arranged as desired, tie the monofilament strands about 10 inches from the top of the ornaments.